This is the second branch of the popular Korean mixed rice restaurant in Soho. 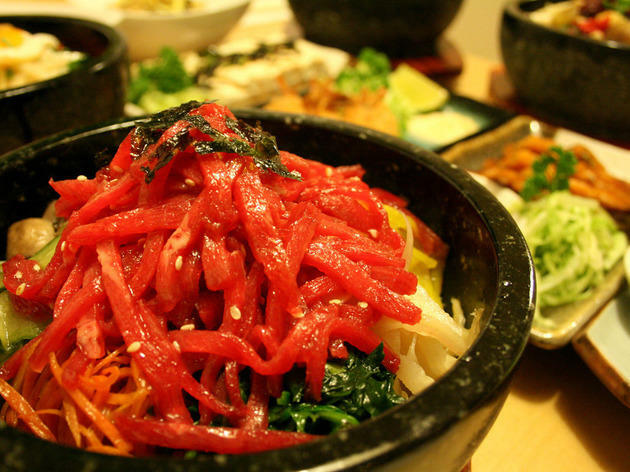 Since the first branch opened in 2011, Bi Bim Bap has become a regular favourite for a cheap and warming bowl of its namesake dish – bibimbap. Served here in hot stone bowls (dolsot), there are ten varieties of the spicy rice mix to choose from including beef fillet, spicy pork and five different veggie options, all topped with a range of shredded vegetables and ready for you to mix with all the chilli sauce (gochujang) and bean paste you fancy. Even the simplest version topped with seasoned vegetables (cucumber, bean sprouts, spinach) and a fried egg was filled with flavour, and just the right amount of crisp rice. Our spicy hotpot with pork slices and hot and sour pickled kimchi cabbage also packed a flavoursome punch. Housed in a much narrower space than the Soho original, what the Charlotte Street branch lacks in spaciousness it makes up for with lively dishes and charming staff. This tiny restaurant located on Charlotte Street differentiates itself from the many shiny venues in the area. The place is very simply decorated and the lights are set far too brightly to create a pleasant atmosphere inside. It's definetely worth a visit if you are looking for a fairly cheap dinner (around £15 pp) in Fitzrovia, but I wouldn't recommend to go for a date or a dress-to-impress night out. A cute and cheerful restaurant, extending to the cartoon characters on the menu. The service can be a bit rush-you-along at business times. The bibimbap comes out properly steaming, and there are more variations than at most Korean restaurants. The novelty factor of Bi Bim Bap is yet to wear off for me after my first visit about 3 years ago. Something theraputic about cooking the meat on the hot bowl, that is then really tasty to eat. Ive been back many times and I will continue to keep going back as been great every time. Okay, so this probably isn't worth five stars in real terms but I absolutely love this place. It's cheap, quick and delicious. The kimchi pancakes are exceptional and the bibimbap is so comforting. I could go every week. Mention the word KFC and you will think of a famous fast food joint and if you’re like me, your mouth will begin to salivate at the thought. Mention KFC at Bibimbap and you realise it’s Korean Fried Chicken and yes your mouth beings to water at the thought of this spicy, crispy Asian delight. This was me all week as I looked forward to a Friday dinner with friends at the Charlotte Street branch. The reality was sadly not as crispy and portioned off too small to feel you could dig into some KFC. Yet the flavour was delicious and the sweet chilli sauce was perfectly sticky, sweat and hot. Moving onto the main event, their namesake dish a large stone bowl with a bed of rice and crunchy vegetables with spicy chicken and fried egg was fresh, fragrant and filling, topped with their home made miso mayo made for a dish I want to return for. Sadly the one thing, a big thing, that let the restaurant down was the poor service. Rude waiters are never nice to experience and instead of enjoying a relaxed evening, we finished our food and continued our night across the road. It’s a great little casual restaurant, with some very tasty food but for the service alone, I don’t think I’ll be rushing back anytime soon. Agree with the comments here - this place is good value for money in the area. If you haven't tried Korean food before, and cautious about spending a lot, then it's worth a visit. 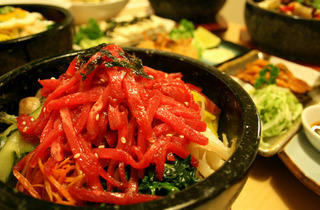 Especially the signature Korean dish bibimbap that the restaurant is named after! The place is very casual dining - small tables close together, and the Korean staff are friendly, but won't say too much. Yummy food with exotic flavours, reasonable priced for what you get and you go away feeling full but know its all fresh what you've just eaten. My partner and I visited this restaurant tonight and were very happy with the choice we made. Neither of us had eaten Korean food before and I was a little dubious of the high veg content but I needn't have been. We were seated straight away by a very friendly young woman and after browsing the menu we decided on the plum wine and the Korean beer. The plum wine is sweet but powerful. We ordered the squi for a starter and both had the chilli chicken in stone bowl. Well, the flavours were great and I just added a little miso sauce to it. I probable would have licked my bowl clean if it hadn't have been so hot! Definitely recommend this restaurant if you're on a budget and want something different. Total for the meal including drinks was a little over £30. We know we'll visit again!